What a wonderful day it was. During the swim I felt how easy I was gliding through the water and was able to stay in a nice group, saving energy for later. My swim-split of 1:03 equals my best of Almere just 3 months ago. I am still losing quite a bit of time here on the lead woman, but at least there is improvement every year. Then there was the beautiful weather and my legs feeling pretty strong, leading towards a 4:54 bike split, again quite close to my Almere split of this summer. Though I was passing a few other Pro woman, there are always faster riders: when Eva Nystrom and Tyler Stewart came along I thought it would be wise to ride my own pace. 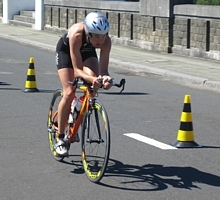 Entering the second transition zone I was quite surprised that I already closed the gap to Bella Comerford on the bike. But when we started the run together I was astonished by her pace and again I thought it would be wise to stick to my own rhythm. It turned out to be a wise decision, since I caught her again halfway the marathon by running a steady 1:29. And by passing Nystrom, Stewart and Schumacher as well I suddenly was in 2nd position to my own surprise! Up to the 30 km turning-point I still was rapidly gaining time on leader Nina Kraft, but the last 10 km were very hard for both of us. My legs were hurting a lot and I couldn't come closer than the 2'05 it was at the finish-line. With my fastest marathon ever (3:06) I put down my personal best again to 9:07:40. And I am very happy with my early Hawaii slot for 2008 as well. This first full-pro year turned out to be quite succesful and this makes it very easy to continue training for next year, I almost can't wait. But first, there is recovery and there are holidays. The first week in Lanzarote was wonderful, the usually strong winds didn't even blow that hard. But in the second week I encountered some bad luck when colliding right into a dog which suddenly jumped in front of my bike. A split second later we both lay down on the asphalt road. The worst of my problems is that my knee is holding me back from a lot of the running I would have liked to do in these preparation weeks towards the Ironman. In the meantime I can run now and I guess I will be recovered fully at November the 3rd, but it is definitely not the preparation I had in mind. Nevertheless I still feel that I have a pretty good basis fitness level this year and I am looking forward to race in Florida. In the end you can't do more than give all you have on race-day and that is what I have to do to make any chance on the beloved Hawaii slots for 2008. With over 30 Pro woman, a strong field is hoping for the same. We will be there some time in advance to enjoy the higher temperatures and get familiar with the course and specific conditions over there. Let's hope for the best! Very good news! A few years ago the new brand of Xentis wheels launched the Mark 1 and in the meantime a lot of triathletes have discovered these nice and fast 4-spoke carbon wheels. Last year we saw Faris Al Sultan in Hawaii with a prototype of the improved version and since this year these Mark 1 TT wheels are on the market. Thanks to a nice sponsordeal with the Dutch representative for Xentis wheels (Legends), I will race on these light, stiff, aerodynamic and very nice wheels for the next 2 years. Of course I am very happy with that and I hope for a very fast and smooth bikeleg on them in Florida. Braking on carbon surface rims requires special brake-pads and luckily Legends supplies me with one of the best, the Yellow King Carbon brake-pads from Swiss-Stop. Almere is more than a month ago and in the meantime I was recovering, picked up some basic training and did 2 Dutch competitions in the second half of September. The first one was the half Ironman distance in Deventer, which is quite a nice new race in Holland. I won the first edition last year and could also win the second a few weeks ago. Rob and I decided that I should swim and bike at maximum speed and then have an easy run if possible to stay in the lead position. I was happy with my swim, but from the start of the bike-part I had to deal with hurting legs, probably since I didn't taper at all for the race and did some power-training in the week before. The run went at easy speed indeed and I was quite enjoying the race in the middle of the town. A week later, just 1 day before we left to Lanzarote, I was racing the Newline half marathon in a little village called Hattem. Of course it was nice to race in my own sponsors (Newline) event, having the luck that no stronger opponents were present so I could win. The victory was definitely not since I was running so well, in the contrary, having some cramps I think that it was the worst race of this season so far. Yesterday was a superrace in Almere. With personal best splits on swimming and cycling and a steady 3.10 marathon I was back at the finishline in a time which was half an hour faster than my previous personal best in Hawaii last year. Despite this fast time, I did not win the race. 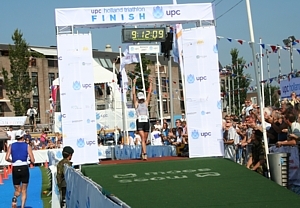 Yvonne van Vlerken finished for the second time below 9 hours (out of 2 starts on this distance) and took the Dutch title. The silver medal was mine. Already before the race I knew that it would require racing at a very high level to make a chance on the title in Almere. Since I have seen racing Yvonne the last few years in Holland I already knew that she is fast, but after her almost-Worldbesttime in Roth we all know that she is the woman to beat on this distance in the next few years. I was pretty happy with my swim leg of 1.03 and being within 5 minutes of the lead. My first bike lap was faster than Yvonnes, but in the second and third lap she even went faster while I was doing all my best to maintain the same level. My bike-split of 4.53 is amazing, but in the marathon I felt that pain in the legs after such a bike-leg is different than in my previous races where I rode above 5 hours. I had plans for a faster marathon, but taking that into account I was happy being strong enough to hold on and finish in a giant personal best of 9.12. This feeling will help me through the next 10 weeks towards my next big race: IM Florida. 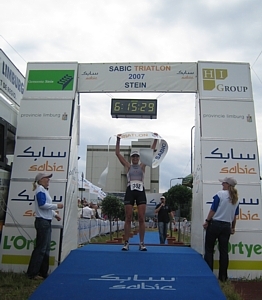 In my first triathlon since my victory in Stein, I had the nice feeling of winning again. 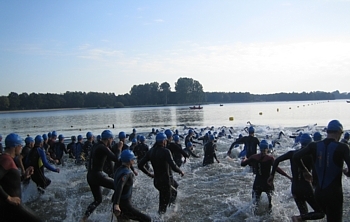 The Open Belgian Championships "Long Distance" were held in Eupen over 2.5km swimming, 80 km cycling and a half marathon running. Quite an unfavourable distance for me and after a swim of 44 minutes I already was 11 minutes behind the Tsjech leader Eva Novakova. With the fastest bike-split I could reduce the gap to 6 minutes at the start of the run. My legs were not as strong as on a real top-day, but I didn't expect that either because of the training volume in preparation on my next Ironman races. And they were just strong enough: at the end of the run I could overtake the lead and with a fast 200m sprint into the finish I won Eupen for the second time in my career (first was in 2004). This was a wonderful sunny day for me (it was about 30 degrees Celcius) and I am looking forward to the Dutch Long Distance Championships now, which will be held on the Ironman distance the 25th of August during the Holland Triathlon in Almere. Today I really much enjoyed racing the long distance in my home town Stein. The race is also called the Dutch Mountains Challenge since the bike and run course have several steep climbs. This does not make it a fast course, but a very beautiful one. Upfront I was looking forward to a probably hard race against last-years winner Ulrike Schwalbe. My swim felt quite good and I am still enthousiastic about the good shoulder-flexibility of my new Sailfish wetsuit. On the bike I closed the gap to the lead already in the first lap out of four and my supporters told me that I was cycling faster than Ulrike. Of course I did feel the pain in my legs on the climbs, but with a comfortable 18 minutes gap I started the run and just enjoyed the four laps like I was flying. Coming into the finish I surprised myself by breaking the course record in a new run record split of 2:03. This is the confirmation to myself that I made the right decision to quit my job and become a full pro this year. Many thanks to all supporters on the course today! Two weeks after the race now, I can still feel that it was a though race. Swimming is not my favourite, but swimming in big waves is even worse. I never swam so long in an Ironman and was already quite exhausted when I started the bikeride. Natascha went like a rocket and I was happy with being among the best of the rest. My legs did not feel so strong as in Kona last year, but the 5:18 was good for this moment on a windy course. Most satisfaction came from the run, where I kept pushing the full marathon regardless the pain in my legs: a small mental victory. The 3:15 was my third (after Lanzarote and Kona last year) on this level and gives me the confidence that this is not just happening on a top-day but becomes my "ordinary" running-speed in an Ironman. Being just behind Niederfriniger, Comerford and Vlot (women with a lot more victories in the past than me) was a good result, although you always hope for more.